Continuing “The Apprentice’s Tale,” for Cavaliers of Mars. We live upon an old world, and you can find that in every aspect of life and death. My master often spoke of the world dying. As a child I imagined I could hear its groaning sighs on the wind. As a grown woman, that is not a fancy I have entirely left behind. My first voyage across the desert began the day after my master bought me. Or, as I’ve come to think, bought my freedom. Clad in long desert robes and silk breathing masks, we set out beyond the borders of the square mile in which I had lived all my life. The desert, then as now, was temperate by day, frigid by night, and extended forever in all directions. Though we followed an ancient track, no one could have seen it who had not learned it by heart. Master to apprentice, as it was with me. My master often said that the sun no longer looms as large as once it did. Certainly, it no longer warms the planet with the same intensity. While the air itself is thin, it is thick with dust, creating the strange scarlet skies. As the sun rises or sets, the dust gives it an eerie blue halo. Like many, my master was superstitious about night and the color blue. Twilight lasts an hour or more at both at sunrise and sunset, and at that time you can clearly see the blue star called Earth. Dust storms are common, and can cover huge regions. We were fortunate not to encounter any during my first desert crossing. A few times a century, a storm will rise out of Hell’s Basin and engulf the entire world. A planet-wide dust storm can leave behind an epidemic of the maddened and possessed. It had fallen to my master sometimes to put such people to the sword. 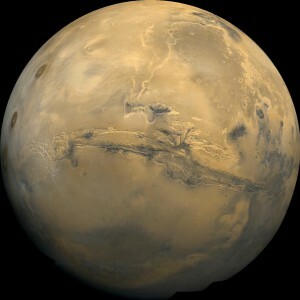 Yet Mars’ greatest waterworks, those which sustain our remaining societies, are the canals. The canals are the final legacy of the First Martians, miraculous channels which melt water from the polar cap and irrigate large sections of the planet. Nearly all of the Red Cities depend on the canals for water and trade, and repairs to the canal network are one of the few subjects which can bring our feuding rulers together in cooperation. What travel and survival rules do you enjoy in RPGs? I’m just starting to design these for Cavaliers of Mars. Next: The Cities of Mars!